Analysis of the future impacts and economic costs of climate change requires climate models. These models require inputs of future greenhouse gas emissions, based on modelled global socio-economic scenarios, to make projections of future changes in temperature, precipitation and other meteorological variables. The ClimateCost project has considered three emissions scenarios: a medium-high non-mitigation baseline scenario (A1B); a mitigation scenario (E1), which stabilises global temperature change at about 2°C above pre-industrial levels; and a high-emission scenario (RCP8.5). Under a medium-high emission baseline (A1B), with no mitigation, the climate models considered in ClimateCost show that global average temperatures could rise by between 1.6°C and 2.3°C by 2041-2070, and 2.4°C and 3.4°C by 2071-2100, relative to the modelled baseline period used in the project of 1961-1990. However, the models project much larger temperature increases for Europe in summer, and strong regional differences across countries, for example, the Iberian Peninsula has a mean projected increase of up to 5°C by 2071-2100. The differences in the precipitation projections between the models are much greater and the distributional patterns across Europe are more pronounced than for temperature. Nonetheless, there are some robust patterns of change. There are wetter winters projected for Western and Northern Europe. By contrast, there are drier conditions projected all year for Southern Europe, where summer precipitation could be reduced by 50% by the end of the century. In other parts of Europe, the changes are more uncertain, and the models even project differences in the direction of change (i.e. whether increases or decreases will occur). Under an E1 stabilisation scenario, broadly equivalent to the EU 2 degrees global target, all changes are significantly reduced. Average global temperatures are projected to increase by about 1.5°C by 2071-2100 compared with the 1961-1990 baseline. Furthermore, the stronger wetter signal in Northern Europe and the drier summer signal in Southern Europe are both considerably reduced. There are still major variations across different models. However, even under this mitigation scenario, the projections do not significantly diverge from the A1B scenario until after 2040. Therefore, summer temperatures in Europe are projected to increase by more than 2°C and possibly in excess of 3°C by 2071-2100 relative to the 1961-1990 baseline even under this mitigation scenario, highlighting the need for adaptation and mitigation. The study has also considered the RCP8.5 ‘high’ scenario. This reaches a global warming of about 3.5°C by 2071-2100 relative to the 1961-1990 baseline. The uncertainty cannot be estimated for this scenario, as only one simulation is available to the project. It is highlighted that the E1 (mitigation) projections only diverge significantly from A1B after 2040 (i.e. the differences only emerge in the latter part of the century). Mean global temperature is projected to increase by about 1°C by 2011-2040 relative to the 1961-1990 baseline, irrespective of the emission pathway, highlighting the need for adaptation and mitigation. As has been found by other studies, projections of future climate change, particularly for precipitation, are uncertain. It is essential to recognise and to try to quantify this uncertainty, not to ignore it. In ClimateCost, this has been addressed with the use of multi-model analysis. This also leads to the need to plan robust strategies to prepare for uncertain futures and not to use uncertainty as a reason for inaction. Christensen, O. B, Goodess, C. M. Harris, I, and Watkiss, P. (2011). 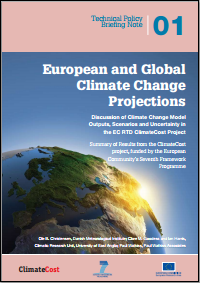 European and Global Climate Change Projections: Discussion of Climate Change Model Outputs, Scenarios and Uncertainty in the EC RTD ClimateCost Project. In Watkiss, P (Editor), 2011. The ClimateCost Project. Final Report. Volume 1: Europe. Published by the Stockholm Environment Institute, Sweden, 2011. ISBN 978-91-86125-35-6.